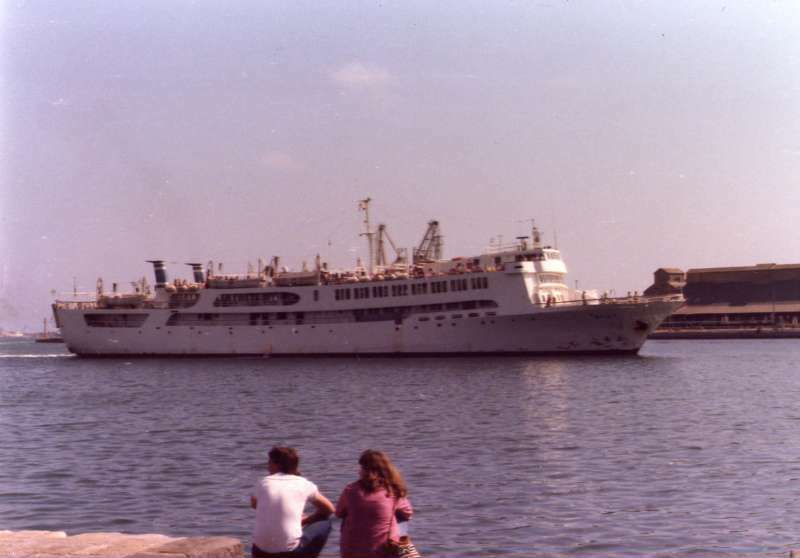 FERRY DURING APPROACH AT BRINDISI ON 1985. I VERY APPRECIATE YR. PROMPTLY REPLAY. This is a historic greek ferry. Thanks for posting this picture. Named 'Elli', she was built in 1966, was 72 x 11,10 x 3,70 m. had two 8-cylindre Deutz engines with total of 4000hp. speed: 19 knots. Routes: 1967: piraeus-cyclads, 1984: igoumenitsa-corfu-brindisi. After that renaimed to 'shinoussa': route from piraeus to cyclads. in 1990 renamed 'paros express', routes within cyclads. rebuilt and renamed to 'ippokratis' in 1993. from 1994-2001 layd-up. In 2001 there were plans to to it back in to service and it was towed to Neos Molos Drapetsona but the work never began so she was layed-up again untill early 2005 when she was sold for scrap.